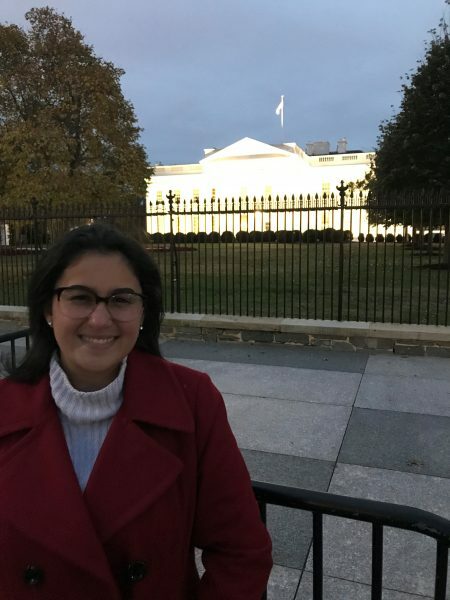 Gabriela D. Hernandez visits Washington, D.C. with the FIU in DC Program immediately after her internship with Congresswoman-elect Debbie Murcarsel-Powell. I was a campaign intern for Debbie Mucarsel-Powell. She is now the Congresswoman-elect for District 26 of Florida, as well as a former associate dean at FIU’s Herbert Wertheim College of Medicine. During my internship, I called voters to encourage them to vote, as well as donate to the campaign. I also prepared mailing cards to keep voters updated on the election. I simply emailed Debbie’s email listed on her campaign website and was connected to those looking for interns. I sent in my resume and had an over the phone interview before being selected. Just get out there! Emailing and calling offices of places where you are interested in interning is the best and most direct way to get results. I got to witness an election in real time, and a fairly important one at that. It was incredible to see the behind the scenes that you always hear about in government classes. I got to apply my knowledge of the structures within our government systems to an actual event. What is the coolest thing about your internship? One of the most rewarding aspects would always happen when I contacted voters. Cold calling is not a glamorous part of the job, but many voters would thank my team and me for the work that we were doing. It was those kinds of calls that helped me stay motivated toward the end of the election. I liked getting to meet people from all over the country who came to help out in this crucial race for South Florida. It was incredible to see the diversity in this campaign and how well everyone worked together for a common goal. I learned that I love to communicate with my community. Having conversations with voters about their goals for the city was an incredible way to learn about points of views I’ve never thought of before. How did this position increase your professional confidence? It has improved my confidence in stepping out of comfort zone to get to where I want to be. No one is going to offer you an internship, much less a job if you don’t ask for one. How have you expanded your professional network? Yes, I did! I met so many incredible people who contributed to the campaign and encouraged me to go even further… to Washington, D.C. I took their advice and participated in the FIU in D.C. program, where I was able to meet even more people to add to my network. I am currently working on acquiring an internship in Washington, D.C. I will be holding that as my next major goal in my professional career. Overall this internship has assured me that I am where I want to be. I am studying what I enjoy, and I am developing in the professional sector that I love.